Young Salmon Risk "Gas Bubble Trauma"
BOISE, Idaho -- Young salmon and steelhead migrating from the Columbia River Basin in unusually high flows face a potentially lethal problem in spillways at dams where increased nitrogen in the water can cause tissue-damaging trauma. However, managers of fisheries say special features at dams meant to reduce nitrogen will help the fish make it to the ocean, and survival should be about average based on previous high-flow years. Like natural waterfalls, a dam's spillway increases dissolved gas, including nitrogen, in water when it smashes into other water below. The nitrogen can cause bubbles to form inside fish, similar to the condition that human divers experience when they get the bends. The standard for total dissolved gas considered safe for fish is 110 percent. 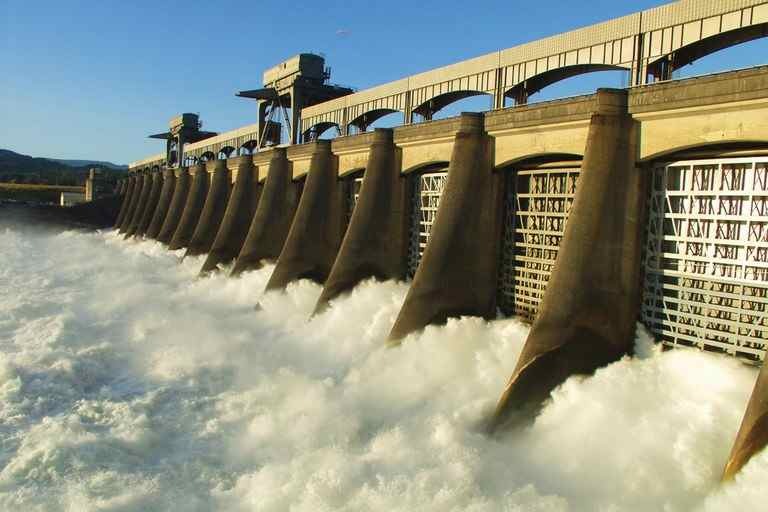 Dams on the Columbia and Snake rivers have been near or above 120 percent in recent weeks. "We're seeing elevated symptoms of gas bubble trauma," said Ritchie Graves of the National Oceanic and Atmospheric Administration. "''But I wouldn't say something horrible is happening at this stage." Fish flows at four federal dams on the lower Columbia River and four more on the lower Snake River are about double what is typical this time of year. As a result, managers are being forced to spill water rather than run it through energy-generating turbines. Graves said studies have found that about 1 percent of fish have symptoms when the total dissolved gas reaches 115 to 120 percent. At 135 percent, about 20 to 25 percent of fish have symptoms that include gas bubbles forming in gill filaments, fins and eyes. Graves said fish can't sense the danger. The problem became apparent with the building of the John Day Dam on the Columbia River. Dissolved gas reached 140 percent, killing thousands of adult fish migrating upstream. In the 1990s, after runs of salmon and steelhead started receiving federal protection under the Endangered Species Act, dams on the lower Columbia and lower Snake rivers began being retrofitted with deflecting structures at spillways to reduce dissolved gas. Called flip lips and costing millions of dollars to install, the structures cause spillway water to shoot out near the surface rather than plunge deep. The result is less dissolved gas in the water. In March, fears of high gas levels below Dworshak Dam in northern Idaho caused hatchery managers downstream to release a million juvenile chinook salmon sooner than usual because they were showing signs of gas bubble trauma. Ann Setter, a fish biologist with the Walla Walla District of the U.S. Army Corp of Engineers, said managers had been monitoring fish before the release, noticing bubbles in the gills and fins in mid-March and days later in lateral lines and eyes. While dissolved gas can be a problem for young fish heading to the ocean, the high flows can help them get downstream faster. "There's some good things and bad things in this," Graves said. "We've seen pretty decent survival."